Breaking barriers: Monisha Kaltenborn Narang (right) with race engineer Marco Schupback at the Indian Grand Prix. 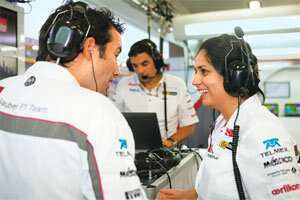 New Delhi: Monisha Kaltenborn Narangis an unusual sight in the pit wall, the nerve centre of a Formula One race. This is where the core members of a racing team—engineers, technical directors, owners—gather to watch and control the race, and for 60 years since the first F1 event in 1950, there was no woman leader at the pit wall. Narang, 40, changed that in 2010, when she was appointed chief executive officer (CEO) of Sauber Motorsport AG, which runs Swiss racing team Sauber F1 Team. It earned her the sobriquet First Lady of F1, a title she is quick to dismiss. The reference is to Bernie Ecclestone, the 81-year-old boss of Formula One. Narang, who was born in Dehradun in 1971 and moved to Austria with her parents when she was eight, took over as Sauber CEO at a time when the team was battling what was perhaps its worst crisis. Halfway through the season, Sauber’s owner BMW decided to withdraw from F1. The team was put up for sale, and after a failed deal, Peter Sauber, its founder, decided to repurchase it. Narang, who had headed the legal team at Sauber since 2000, was named chief executive and given the mandate of preventing the team’s disintegration. “It was the most unorthodox thing, taking up this job," Narang says. “If you look at the economics of it, nothing was in place except for pure determination. We were fighting for the existence of the team. Instead of the usual six months to prepare for a season, we had about eight weeks. The challenge was to bring calmness into the team, secure funding, keep people from leaving, and to make sure the team believes in itself." Sauber spent the first six races of 2010 without a point, and without a single sponsor, before starting to turn things around and finishing eighth out of the 12-team field. “This year has been pretty normal," Narang says, “We didn’t have all the changes and the anxieties related to it, but by having that stability and focus again, you have higher ambitions, higher targets, and you are much more in the competition, so the pressures get very different." Sauber, with 41 points, is seventh in the constructors’ standings after the Indian Grand Prix. In the heat and dust of the Buddh International Circuit, amid the roar of F1 engines, Narang is a picture of calmness in Sauber’s white team colours. She sports a large pair of headphones that relay information from the drivers, the team director, the engineers, and the support staff connected through telemetry at Sauber’s headquarters in Hinwil, Switzerland. Along with team principal Peter Sauber, Narang is responsible for making split-second decisions that can affect the course of the race for Sauber’s two drivers. She needs to keep a close watch on the performance of the cars, the readiness of the pit crew, the health of the drivers—any issue that might need her attention during the three-day F1 event. On Friday, a practice day, Narang spends most of her day at the pit wall, watching how the car and the drivers are reacting to the brand new circuit, before attending a series of meetings with F1 management, the Federation Internationale de l’Automobile (FIA), her crew and drivers, and with the other teams. Saturday, the qualifying day, is spent in fine-tuning strategies before confronting the excitement and anxieties of Sunday, race day. On all three days, Narang is at the circuit by eight in the morning, leaving around 10 at night. “There are two sides to my job," Narang says. “On one side it is a CEO’s job like any other medium-sized enterprise, with your usual problems. Then there is this other exciting, adventurous side, the races every two weeks during the season. Here we have no safety margins. In other businesses, you have safeguards, you have a choice of instruments, you can balance your risks." “Here we are on the edge, we are always fighting for maximum. We work all year towards performance, towards a competition, and you can put everything in the right place for the race, but you can’t control the race. For example, you start a race and someone bangs you from behind, and that’s the end of the event for you. That’s the thrill." Her words proved to be prophetic when Sauber’s Japanese driver Kamui Kobayashi crashes out of the race after being hit from behind seconds into the start. Narang’s most daunting moment as Sauber’s CEO came on 28 May at the Monaco Grand Prix. Sauber’s rookie driver Sergio Perezcame out of a tunnel at the circuit during qualifying at around 280km per hour, lost control of the car, and crashed into a wall. The crash destroyed the right side of the car, which hit another barrier. It took medics almost 20 minutes to ex tricate Perez. “That was something I did not know how to handle at that moment," Narang says, “When you see the pictures and you don’t have contact with your driver because the system is not working due to the impact of the crash, and your mind just starts thinking… You can’t go there and do anything." “Perez’s father was there in the garage. It’s emotionally very tough, the challenge is to stay calm and stay quiet, because you can’t say the right thing, because you don’t know." Perez escaped with minor injuries. Narang says she has never faced any problems being a woman in a male-centric sport. Ecclestone, for example, once said women’s role is in the kitchen “dressed in white like all other domestic appliances". “It is a fact that there are more men than women working here," Narang says. “Historically there have only been male drivers, male technical directors, male team principals, so it does have that image. But I think it’s simply a matter of a very large concentration of jobs on the technical side. Anywhere in the world, in any area like that, you do not have many women. So it’s just a matter of time till that starts changing." Narang, who is a member of the FIA’s Women and Motor Sport Commission agrees that women do face a social barrier in the sport. “It starts at home," she says. “I know a very talented young girl driver who was asked what she wanted to be and she said she wanted to be a Formula One driver. Her father said ‘but that’s so difficult, you should have a Plan B’. Now if it was a boy saying he wanted to be an F1 driver, everyone would have praised him for his focus." At the commission, Narang tries to spread awareness about women in motorsports and gives information and guidance to young girls interested in the sport. The toughest challenge for Narang, though, is the constant travelling the F1 season demands, which means less time spent with her nine-year-old son Nirek and six-year-old daughter Mandira. While her connection with India is now tenuous at best, Narang had a surprise reunion on the racing circuit. Old friends from the Welham Girls’ School in Dehradun, with whom she had lost touch decades ago, established contact with her at the race. During the event, however, there was no time for Narang to think of anything else but the team.